Freelance lawyers to cover fixed-term needs. For all the talk of innovation in the profession, experimentation with new models has so far been more evident at mid-pack players like Berwin Leighton Paisner (BLP) and Eversheds than elite London or New York advisers. However, as Legal Business revealed on 25 November, Allen & Overy (A&O) has become the first top-tier outfit to challenge that orthodoxy with the Magic Circle firm launching a high-end contract lawyer service for major clients. QualitySolicitors (QS) has unveiled plans to abandon the hourly rate across its network of firms, offering fixed fees for all legal services including litigation. However, as Legal Business reveals today (25 November), Allen & Overy (A&O) has become the first top tier outfit to challenge that orthodoxy with the Magic Circle firm launching a high-end contract lawyer service for major clients. As general counsel (GCs) push their advisers to think more innovatively about costs savings, Slaughter and May has begun offering the services of Carillion’s new low-cost legal arm to its own clients, including a recent transaction for key client Vodafone. The Magic Circle firm, which is one of Carillion’s lead corporate panel advisers, offered Vodafone the option to use Newcastle-based Carillion Advice Services (CAS) on an undisclosed deal, which included a customer contract exercise. City law firms are being challenged to revise the way they view their information technology (IT) teams and elevate them to a far more strategic level. As examined in this month’s special legal tech feature, the role of individuals who manage IT teams is now acknowledged as critical but firms’ thinking about where those departments fit into their hierarchy is often out of touch when compared with new entrants. During the original dot-com boom, there was a brief period – oh so brief – when legal technologists and managing partners were almost on the same page. With both camps dreaming of dramatic use of IT projects to revolutionise the legal business – the era of Blue Flag – there were big sums signed off, in many cases with poor results when it came to the hard grind of implementation. Dot-com boom turned to bust and IT professionals were once again from Venus and fee-earners from Mars. A law firm pumps out marketing bumpf about how awesome it is and it is received – with ample justification – as self-serving twaddle. An alternative legal services provider pumps out marketing bumpf about how awesome it is and it is met with a round of applause, rather than as the self-serving twaddle wrapped in utopian geek speak it usually is. The point? These days there are a lot of people talking down law firms. True, plenty of criticism regarding conservatism, high costs and lack of genuine client focus is still justified. But to judge by some claims, law firms aren’t just greedy unresponsive bastards, they are greedy unresponsive bastards standing on a burning deck. The single-supplier legal advisory model appears to be gaining traction as Pinsent Masons has won its second exclusive fixed-fee contract this year, with energy giant E.ON appointing the firm as sole legal advisor for general matters, a first in the energy sector. While pundits are queuing up to pronounce the death of the industry’s model, Legal Business canvassed senior figures to devise some practical ideas to make a law firm work better. You don’t have to look far in the legal profession to find causes for gloom. 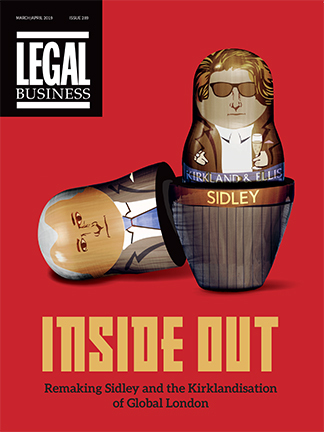 Battered by a sustained malaise in Western economies, more assertive clients and the threat of legal service liberalisation in the UK, a growing band of observers, general counsel and industry figures have argued that the traditional model of commercial law is fundamentally broken.